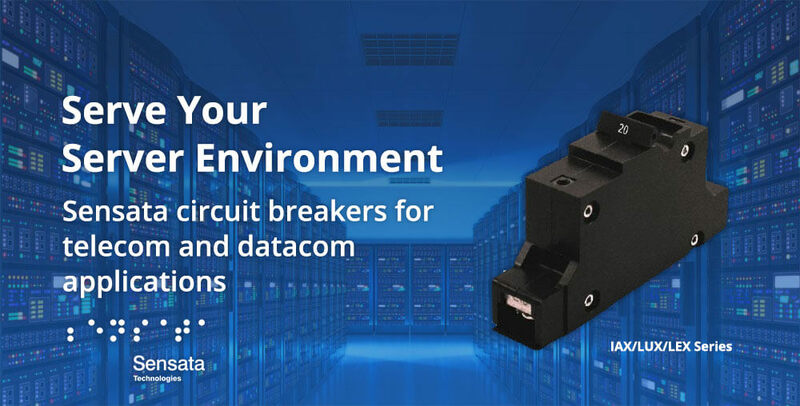 Sensata Circuit Breakers: Increase Telecom & Datacomm Efficiency and Free Up Server Space » HHP Associates, Inc.
Sensata circuit breakers for telecom and datacom applications help to increase efficiency and reduce system cost. Compact design can also free up space on server racks for more computing power. The IAX/LUX/LEX Series low-depth, hydraulic magnetic circuit breaker pictured above allows increancreased density in datacenter rack power distribution units while leaving more space for equipment, wiring and airflow. These UL-489 Listed and IEC 60947-2 (pending) breakers are available in 1 and 2 pole models using a unique handle actuator (patent pending) which minimizes breaker volume while maintaining reliable switching and over current protection. Available high interrupt capacity 10 kAIC and low resistance all copper conductors meet the needs of high performing, high efficiency datacenters. See more series and solutions for the telecom industry here.